Allee® ('Emer II') Lacebark Elm was selected by Dr Dirr on the campus of the University of Georgia at at Athens. 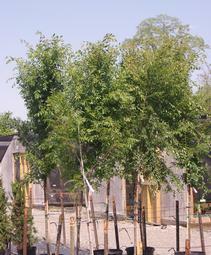 Ulmus parviflora Allee® has a beautiful vase-shaped habit similar to the classic American Elm, but it also has excellent resistance to Dutch Elm and Phloem Necrosis. The foliage is smaller and the bark is attractively mottled in shades of green, orange, tan and gray. Allee® handles urban conditions well, and has proved to be an excellent addition to urban street street tree choices. The small white bell-like flowers of Lowbush Blueberry in May are followed by delicious glaucous blue fruit in late summer. This suckering native shrub will mature to make a wide patch. It tolerates rocky, dry sites. Fall color is a spectacular combination of reds, bronzes and oranges. Highbush Blueberry has white flowers in May, powder blue delicious fruit in summer, and good scarlet fall foliage. 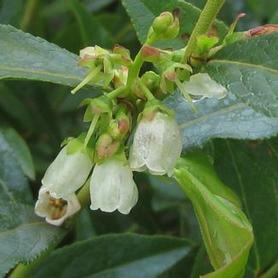 Vaccinium corymbosum tolerates acidic soils, very wet sites as well as salty sites. We have chosen varieties that perform particularly well in the Mid Atlantic Region: 'Berkeley', 'Blue Jay' and 'Jersey'. For best fruit production, use two or more cultivars. 'Blue Jay' Highbush Blueberry produces delicious fruit in June and July, making it a mid season Blueberry. The delicate waxy bell-shaped flowers are white and are attractive to pollinators in May. The fall color of Vaccinium 'Blue Jay' is bright shades of red and orange, and the winter twigs are also attractive as cut branches. Plant with another cultivar for good fruit production. 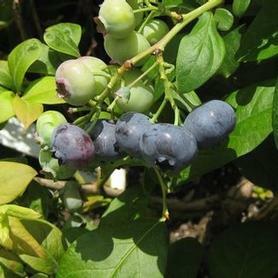 'Bluecrop' Highbush Blueberry is a mid-season fruit producer, bearing lots of glaucous blue fruit in early to mid July. The bell-shaped white flowers appear in May and are attractive to butterflies and pollinators. 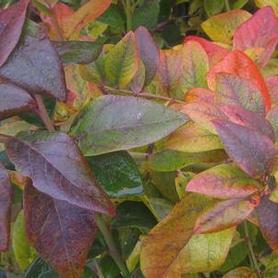 The green disease free foliage turns attractive shades of red tones in fall, and the twigs maintain the red tones throughout the winter. 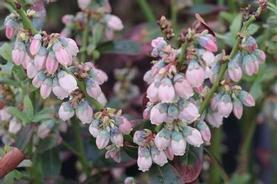 Vaccinium 'Bluecrop' is a good commercial cultivar which performs best when planted near another cultivar. Blueberries thrive in wet, acid sites. 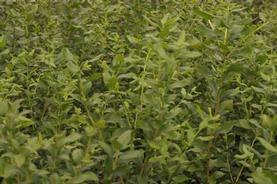 'Jersey' Highbush Blueberry was selected for its commercial fruit value in the mid Atlantic region, producing large high quality berries in late June and July. It is considered a mid to late season Blueberry, and is a great cross pollinator for other Highbush Blueberries. The waxy white bell-shaped flowers appear in May in pendant racemes. The fall color is attractive shades of yellow, orange and red, followed by attractively colored winter twigs. All Vacciniums prefer constant moisture and acid soils. 'Sunshine Blue' Southern Highbush Blueberry offers great possibilities as a landscape plant in addition to its fruit producing qualities. The glaucous blue foliage emerges in spring in shades of bronze and ends up in fall in shades of red and burgundy. The drooping racemes of delicate soft pink bell like flowers appear in May, and are followed in June and July by glaucous blue edible fruit (birds will clean them out if you do not net your plants). 'Sunshine Blue' is self fertile so it does not need a pollinator. 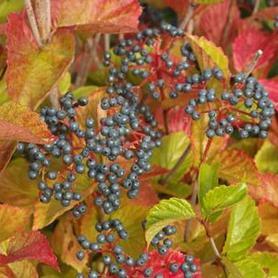 Mapleleaf Viburnum is a tough, adaptable plant which thrives in shady, dry sites. Creamy white flat-topped flowers in May are followed by purple fruit in late summer and fall. 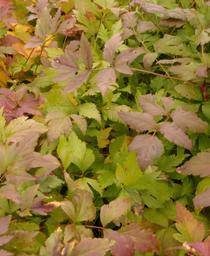 Foliage is green in summer, changing to subtle shades of pink, rose, red and purple in fall. Will become a broad colony eventually because of its suckering habit. Deciduous. PRN Preferred: Exhibits so many great attributes: a broad site conditions range, attractive flowers & foliage, food for wildlife and deer resistance. 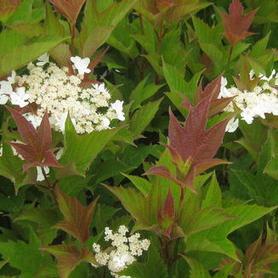 Koreanspice Viburnum has wonderfully fragrant white flowers in April and May, followed by red and burgundy fall color. Deciduous. This and V. x juddii produce the classic scent we love so much from Viburnums. 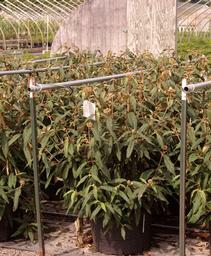 An added attraction is that V. carlesii actually thrives under Black Walnuts. Spice Girl® ('Spito') Koreanspice Viburnum blooms in April and May, producing extremely fragrant flower clumps that are pink in bud turning to white snowballs when open. The medium green foliage is more deer resistant than most Viburnums, and the leaves turn attractive shades of red in fall. 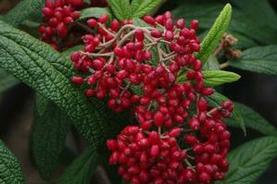 Viburnum carlesii Spice Girl® does well in sun and partial shade. It would make a lovely fragrant hedge as well as an attractive specimen. 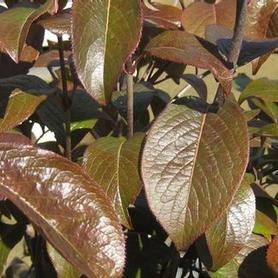 Chicago Lustre® ('Synnesvedt') Arrowwood Viburnum has beautiful glossy foliage that is topped with white flat flowers in May and June, followed by stunning cymes of bright blue fruit in late summer. Fall color is a nice reddish purple. An excellent introduction by Chicagoland Grows® and Daryl Kobesky's favorite Viburnum. This is a great substitute for Euonymus alatus 'Compacta'. Important food source for migrating birds. Deciduous. 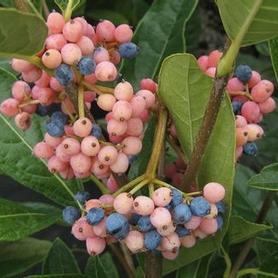 PRN Preferred: A multi-season Viburnum, offering showy flowers, fruit and fall color. 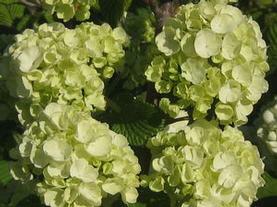 Chinese Snowball Viburnum produces an enormous quantity of lovely sterile blooms. The snowball flowers hang from the branches in May to June, changing from lime green to white as they mature. Viburnum macrocephalum makes a large vase-shaped plant which bears a close resemblance to a Pee Gee Hydrangea when in bloom. 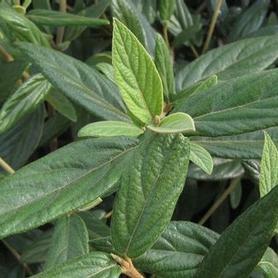 The green dentate foliage is attractive and disease resistant and somewhat pubescent. Since the flowers are sterile, there is no fruit. Pruning for a tighter shape is best done just after the bloom period. A native of China. The white fertile flowers of Brandywine™ ('Bulk') Smooth Witherod appear in summer over glossy dark green leaves. Fruit display in fall is a stunning mix of rosy pink and dark blue, over deep reddish maroon leaves which persist for a long time. 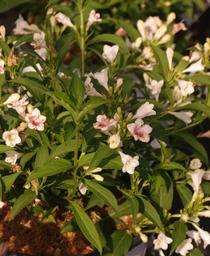 Best pollination results are achieved by planting it with V. 'Winterthur'. From plantsman Mark Bulk. It is wet site tolerant and deciduous. 'Winterthur' Smooth Witherod has white flowers, beautiful pink and purple fruit in summer, and burgundy fall color. Selected by Bill Frederick, with his usual impeccable taste. It is also wet site tolerant and deciduous. Needs a pollinator like V. Brandywine™ for best fruit production. 'Kern's Pink' Doublefile Viburnum has pale pink 3" snowball flowers in May, over bronzy foliage which turns green as the summer progresses. Viburnum plicatum 'Kern's Pink' produces some white snowball blooms concurrently with its pink flowers, which makes for an interesting bi-color effect. Found by Carl Kern, a nurseryman in Cincinnati, Ohio, and encountered in the nursery trade under a number of different names. 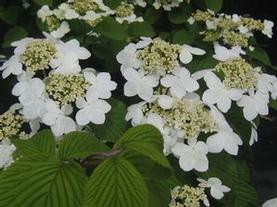 'Popcorn' Doublefile Viburnum produces large quantities of big white snowball blooms in April. The sterile flowers start lime green before maturing to white, and make a stunning show for a month. The habit is upright and somewhat compact. 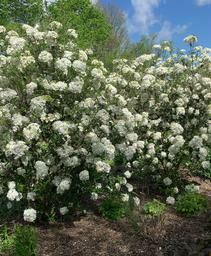 Introduced by David Leach of Ohio, and Dr. Michael Dirr's favorite of the Snowball Doublefile Viburnums. 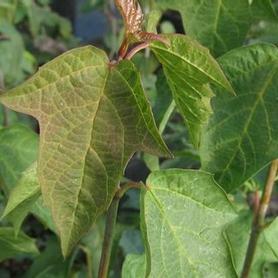 Deciduous, with dark green leathery foliage which stands up to heat better than many of its cousins. PRN Preferred: The snowball flowers last for a very long time and gradually change from green to white. 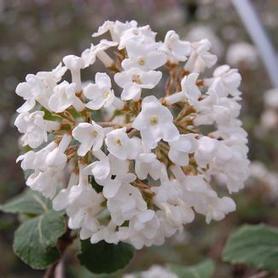 'Mariesii' Doublefile Viburnum boasts showy white lacecap flowers in May and June often followed by red fruit in fall. Flowers profusely. It does best in a moist, partially shady spot. Deciduous. 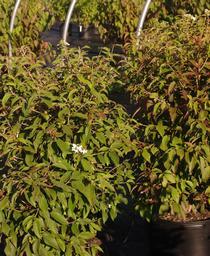 'Shasta' Doublefile Viburnum becomes covered with showy flat white flowers in May and June. Another extraordinary plant from Dr. Don Egolf of the US National Arboretum. Plant in moist, partial shade locations for best results. Deciduous. 'Watanabei' Doublefile Viburnum has beautiful white lacecap flowers starting in May and intermittently continuing throughout the summer. The habit is significantly more compact than other Viburnum plicatum tomentosum cultivars and the reblooming attribute, while requiring consistent soil moisture, makes Viburnum 'Watanabei' particularly useful. 'Watanabei' was found near Mt Fuji by famous Japanese nurseryman Mr. Watanbe and introduced by Wada Nursery in the 1950s. Red fruit is sparely produced in late summer, followed by nice reddish burgundy fall color. Blackhaw Viburnum has white spring flowers which are very showy in mass, followed by bluish black fruit which birds love. 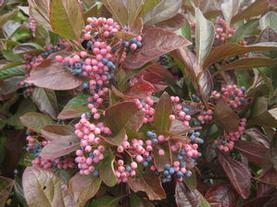 The fall color of Viburnum prunifolium is a handsome mix of orange, red and purple. Can be grown as a very large shrub or a beautiful small ornamental tree. There is a spectacular treeform example of this versatile native at William Frederick's home in Delaware, which convinced us to grow it as a small ornamental tree as well as a shrub. Deciduous. Leatherleaf Viburnum is a staple shrub for deer county, because the somewhat hairy puckered leaves are not tasty to deer. 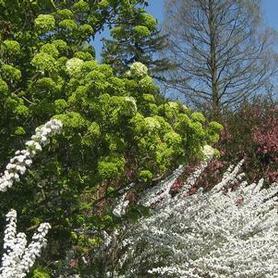 The foliage is evergreen, and is topped by flat creamy white cymes (flower clumps) in late spring. The long lasting fruit bunches turn red in early fall and mature to glossy black, often persisting into December. Viburnum rhytidophyllum makes an excellent large hedge when planted in masses, and is dense enough to serve as a green fence. 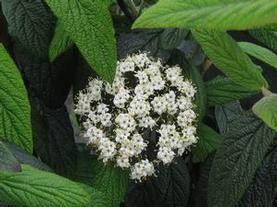 'Cree' Leatherleaf Viburnum has white flowers and a compact habit. 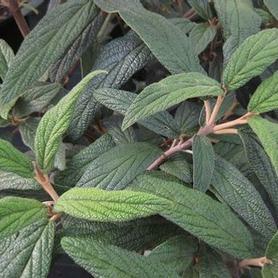 The lustrous, leathery foliage is evergreen and more attractive than the species in the winter. Another great plant from the US National Arboretum. 'Green Trump' Leatherleaf Viburnum is a wonderful compact form of Leatherleaf Viburnum from Holland, with a rounder more lustrous dark green evergreen foliage, white flowers in summer and much welcomed unattractiveness to deer. This is our favorite Viburnum rhytidophyllum. 'Bailey Compact' American Cranberrybush flowers are showy white flat-topped cymes in May, followed by glowing red fruit which persists well into winter. Foliage changes to deep red in fall. Found at Bailey Nurseries in St. Paul, Minnesota, combining extreme cold tolerance with landscape beauty. It is also wet site tolerant, and deciduous. 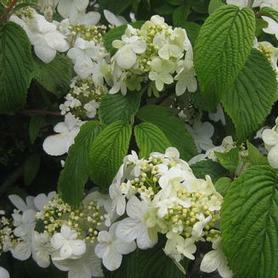 'Nantucket' Viburnum came from a cross made by the late Dr. Egolf between V. x 'Eskimo' and V. macrocephalum f. keteleeri at the National Arboretum in 1988. For some reason this excellent plant only recently got the notice it deserves. 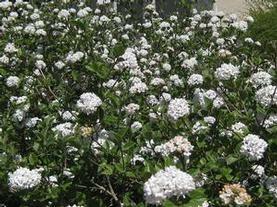 The large white ball-shaped flowers appear in April and are mildly fragrant. The neat dark green leaves are semi-evergreen, and Viburnum 'Nantucket' has shown excellent heat resistance, according to Dr. Michael Dirr. The habit is somewhat upright, and would be effective as a hedge as well as a specimen plant. The highly fragrant pink and white flowers of Burkwood Viburnum have an extended bloom period, glossy foliage is semi-evergreen. Prague Viburnum has white flat-topped flowers in May, but the glossy dark green foliage is what makes this Viburnum notable. The leaves are smaller and more lustrous than Leatherleaf Viburnums. Semi-evergreen and very cold tolerant. 'Alleghany' Lantanaphyllum Viburnum comes from the breeding work done by the legendary Dr Don Egolf of the National Arboretum. The creamy white flat flowers clumps appear in May and June. They are followed by attractive red fruit in summer which ripens to blue black and is rapidly consumed by birds. The leaves are dark green and broader and shorter than V. rhytidophylloides. 'Alleghany' is a cross between rhytidophyllum and Lantana, so it makes a dense semi-evergreen hedge. 'Dart's Duke' ('J.N. Select') Lantanaphyllum Viburnum has very large showy white flowers in early summer and bright red fruit in fall. The beautiful dark green leathery semi-evergreen foliage makes this Viburnum from Darthuizer Nursery in Holland a real winner. Foliage is very clean and disease-free, and does not droop in the winter as other rhytidophylloides do. PRN Preferred: We love the lustrous green leaves that do not droop in winter. 'Shoal Creek' Chastetree has bluish violet flowers in July and August over aromatic grayish green foliage. Butterflies love this plant and it is also dry site tolerant. 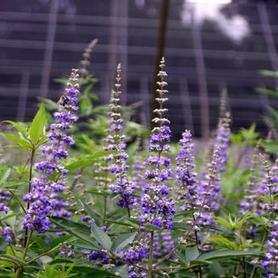 Vitex agnus-castus 'Shoal Creek' should be cut back hard like a Buddleia in spring. 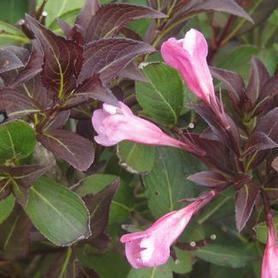 Fine Wine® ('Bramwell') Weigela is one of the newest burgundy Weigelas with a tight compact habit and a profuse display of rosy pink flowers in May and June. The foliage color holds its intensity well in the summer. 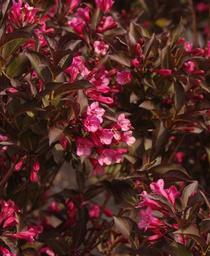 Sonic Bloom® Pearl ('Bokasopea') Weigela is another exciting rebloomer from Proven Winners. The tubular blooms open white in May, and turn soft pink as they mature. 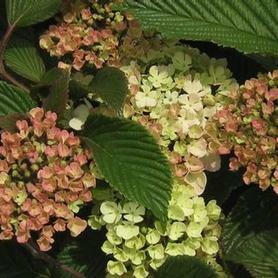 Sonic Bloom® 'Pearl' blooms throughout the summer, especially if lightly pruned after the first heavy flush of flowers. Since this Weigela is easy to maintain and prune, Sonic Bloom® 'Pearl' works well as a foundation shrub or a short hedge. The attractive green foliage is clean and disease free. 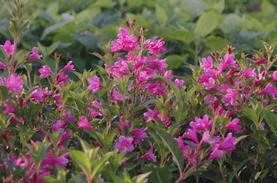 Sonic Bloom® Pink ('Bokrasopin') Weigela is a reblooming shrub which produces a series of bright pink trumpet shaped flowers. 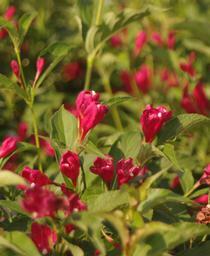 Sonic Bloom® Pink starts blooming heavily in May, and continues well into the summer months. The green foliage makes a good setting for the blooms. A light pruning after the initial explosion of flowers will make for a stronger rebloom, but it is not essential. Good as a foundation shrub or in mass plantings. Sonic Bloom® 'Red' ('Verweig6') Weigela produces a multitude of vivid red trumpet shaped flowers in May, followed by repeat waves of flowers until early fall. The green foliage makes a showy setting for the lipstick red blooms, and a light pruning after the first flush will increase the rebloomimg. Pollinators will love this adaptable, long blooming shrub, and Sonic Bloom® 'Red' makes an excellent hedge or foundation plant. 'Color Guard' Adam's Needle has a creamy-yellow center stripe that turns rose colored in cooler weather. The white long blooming flower spikes appear in June and July. 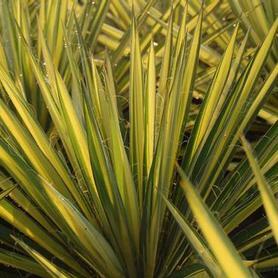 Yucca filamentosa 'Color Guard' is evergreen and salt tolerant.